Dolen Perkins-Valdez will be speaking at NWA's annual benefit, Every Person is a Philosopher, at the School of the Art Institute Ballroom. Pick up a copy of her New York Times bestselling historical novel, Wench, and join the discussion! Dolen Perkins-Valdez reads from Wench. Dolen Perkins-Valdez's book We Wear the Mask: 15 True Stories of Passing in America was available from LibraryThing Early Reviewers. 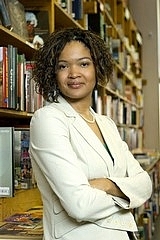 Dolen Perkins-Valdez is currently considered a "single author." If one or more works are by a distinct, homonymous authors, go ahead and split the author. Dolen Perkins-Valdez is composed of 2 names. You can examine and separate out names.